I’m back over in Ireland working again this week. I travelled over on Sunday sailing right into the face of “Storm Clodagh”, so a rough crossing to say the least. I’d taken the early boat, which meant getting up before the crack of dawn as rather than spent all day travelling, I wanted to take some time to do something interesting. The ferry docked at 12:30 and I decided to visit the Irish Museum of Modern Art (IMMA). It’s a while since I’d been there and there were some new exhibitions to see. 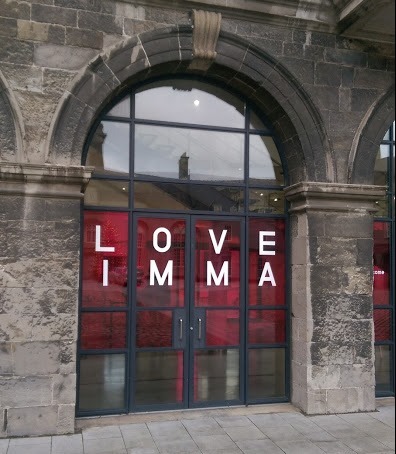 The main exhibition on at the moment is What We Call Love: From Surrealism to Now which, as the name suggest had works covering the period from surrealism to the 21st Century. 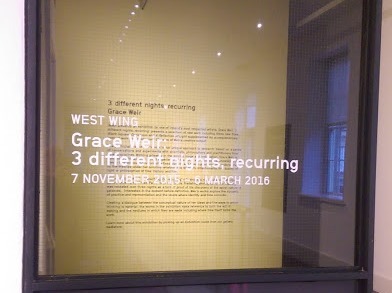 I enjoyed it well enough but afterwards I decided to have a look around the other main exhibition featuring work by the Irish artist Grace Weir – 3 Different Nights, recurring. To be honest I’d never heard of her before (although she had represented Ireland at the Venice Biennial and a few years ago had an exhibition at the Cornerhouse in Manchester) and the description of the exhibition didn’t particularly fire my enthusiasm. But I decided to have a look anyway and I’m glad I did as I thoroughly enjoyed it. Grace Weir is clearly interested and inspired by science as she is currently Artist-in-Residence in the School Of Physics, Trinity College Dublin. She works “primarily in the moving image and installation” (exhibition website) and the exhibition features a number of films, including three new works produced for the exhibition, but there also works in other media – including photography, sculpture, drawings and paintings. explores the making of an image of the black hole that lies in the exact centre of the Milky Way Galaxy. Black in a black sky, these holes are one of the last unknowns in physics. Documenting the film crew as they journey across the Atacama Desert in Chile to the Very Large Telescope at the top of Cerro Paranal, where the astronomy team are at work. It was rather lengthy at over 40 minutes so, unfortunately, I didn’t have time to watch it all the way through. Two of the works on paper 3 different blacks (2015) and Future Perfect (2015) have been produced using non-lightfast inks. The colours will fade over time as they are exposed to sunlight so the works will evolve and change until the colours eventually completely vanish. An interesting approach as most artists want their paintings to be preserved for posterity. Rather reminds me of some of the Land Art artists like Andy Goldsworthy, Richard Long and David Nash who create works that are either ephemeral or change over time. is an installation created following a period of research with Ruth Byrne, a Psychologist and Professor of Cognitive Science in Trinity College Dublin, that probes a relationship between the effects of fiction and an analysis of psychological reasoning. Potential misperceptions of another’s intentions unfold through a framework of stones and the sea. Replacing the grey carpet tiles from a corner of the room, with a graduated sequence of blue tiles, If only something else had happened, re-creates a logical sequence of all the possible combinations of A and B using stacks of paper and black and white stones on a tabletop. 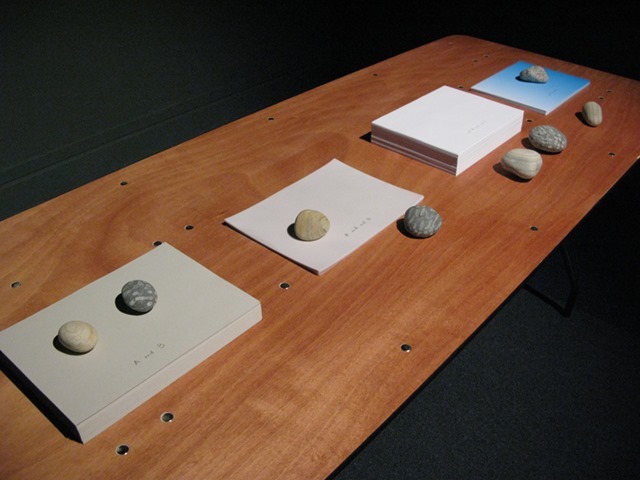 Subtle differences in the paper types and shapes of stones call into question the logical deductions, when content and context are introduced. Forgetting (the vanishing point) a long take of a real cloud dissipating over time. The cloud completely disappears in 9 minutes and 40 seconds. The work references a demonstration of linear perspective by Brunelleschi in the 15th century. The video was projected from a small, miniature projector standing on a couple of books onto the blank page of a third book. 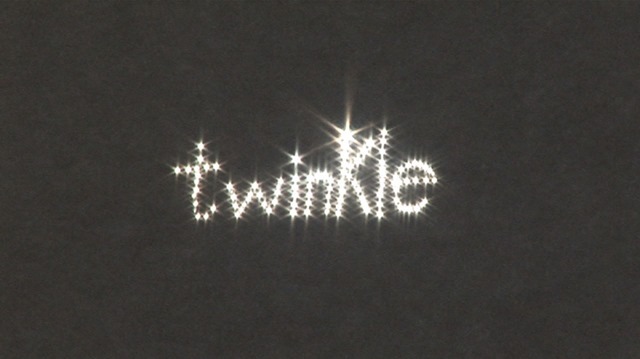 Script (1) Summer studio In the short video the artist spells out the word ‘twinkle’, making pinholes in a sheet of paper. The word becomes visible when the paper is taped onto a window and the light streams through it. Dust Defying Gravity (2003) – a 4 minute tracking shot that traces through the rooms at Dunsink Observatory, showing the antique telescopes and instruments around the building. The final shot illustrates the Tyndall effect – scattering of light by minute dust particles that makes them visible. These are just a selection. There was more to see and I would have liked to have spent more time looking at the exhibition. It’s always good to discover an interesting artist – a pleasant surprise. This entry was posted in Art and tagged 3 different nights recurring, Art, Dublin, Grace Weir, IMMA, Ireland, Irish Museum of Modern Art by ms6282. Bookmark the permalink.